The fourth grade Hebrew school curriculum at Rockdale Temple focuses on learning prayers, specifically, the Shema and her blessings. Ideally, the students will be able to read and recite the prayers at the end of the year. But more than that, I hope they come away with an understanding of and sense of connection to the prayers. In trying to help my students connect to the words of our tradition, I thought of Ron Berger and his theories of project-based learning. In his book An Ethic of Excellence,he writes: “There’s only so much care and creativity that a student can put into filling in the blanks on a commercially produced worksheet.”  How could I expect my students to engage and connect on a more personal level if I didn’t give them opportunities to think carefully and creatively about each prayer. Thus the project of creating our own prayer book was born. By the end of the year, it will have eight unique creative reinterpretations of each prayer included in the Shema and her blessings. Here is our process: After we learn to read and recite a prayer, students are asked to read the English of the prayer on their own and then represent the prayer in their own ways. Students have chosen to draw, to write a poem, or to rewrite the prayer in their own words. Each student is asked to do a draft—or, as they call it, “a sloppy copy”—before doing the final product which will be put into our class prayer book. These two drafts help the students think more about each prayer, get feedback from the teacher and peers, and create higher quality work. Through this project, I have seen fourth graders gain knowledge of prayers that is greater than just reciting them from memory. One student was working on an acrostic poem for Shema and struggling to fill in the letters. We read through the English a couple times together. We talked about what the Shema tells us about God, and what the meanings of the words were. Afterwards, he was able to tell me in his own words what he thought the Shema meant and why we said it. He also had created a poem he was proud to put in our class prayerbook that focused on why we say the Shema. The project has also given students the opportunity to ask questions about God and think about what it means to them when they pray to God. A student was working on writing her own version of the Yotzeir Or, when a madrichapulled me aside. 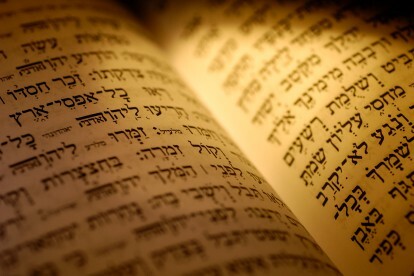 The madrichawas unsure of what to do because the student had written in her prayer “God created everything, but not really because I do not believe in God.” This became an opportunity for me to talk to the student about their belief in God, and also an opportunity to teach our madricha. The student and I took a moment to have a conversation about God, with the madrichalistening in. I explained that not being sure God exists is common and is okay in Judaism. We then talked about the possibility of praying because we are thankful for creation even if we aren’t sure it was God who did the creating. Finally, I shared that Judaism and science don’t have to be viewed as contradictions. Throughout the whole conversation, I could see the student engaging with her Judaism, and the madricha nodding as she learned how to help students talk about God and maybe also learn about her own ideas of God. Without project-based learning, which led me to develop this class prayer book project, I am not sure the student would ever have shared her questions about God with me. We also would not have had an opportunity to understand how Judaism and science can complement each other. Finally, I might not have realized that our students need to know that questioning God is an authentic part of Judaism. By bringing project-based learning into my classroom, I have been able to creatively engage my students in deep learning about prayers. This project has helped me better understand my students’ ideas about prayers and what is important to them, while also helping my students understand and connect to their Judaism and its ancient liturgy. Ron Berger, An Ethic of Excellence: Building a Culture of Craftsmanship with Students(Portsmouth, NH: Heinemann, 2003), 65.